Vereen, of ‘Pippin’ and ‘Roots’ fame, conducts a master class for UM College of Arts & Sciences B.F.A. in Musical Theatre students. Fresh from an appearance at the Aventura Arts and Cultural Center, Tony Award-winning singer-dancer Ben Vereen conducted a master class at the University of Miami’s Jerry Herman Ring Theatre on Monday, sharing with students not only a wealth of acting tips and methods perfected over a 40-plus-year career on the stage and screen but also doling out a substantial amount of advice on life. 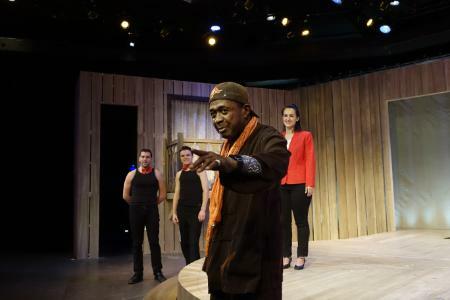 Displaying the energy he’s brought to many of his theatrical performances and one-man shows, Vereen told students that awards and recognition, while important, should not dominate their thoughts and be the only motivation for entering the profession. His appearance at the Ring Theatre—known for having given birth to the acting careers of notable alumni like Steven Bauer, Ray Liotta, Dawnn Lewis, and Sylvester Stallone—came a day after he performed his nightclub act in Aventura. “Education has always been a high priority with him, and he’s always wanted to boost the importance of the arts in society,” Stephen Di Benedetto, chair of the UM College of Arts & Sciences’ Department of Theatre Arts, said of Vereen, noting that it was the legendary actor who reached out to his department with the idea of conducting a master class at UM. Vereen, who has starred in numerous television programs and is well known for his Emmy-nominated role as “Chicken” George Moore in Alex Haley’s landmark 1977 television miniseries Roots, challenged students to find in themselves the imagination to play a multitude of challenging roles. “I’ve never been a cancer patient or a kleptomaniac. Where does that kind of behavior live inside me? That’s where the imagination comes into play,” said Vereen, telling students that such creativity will help them portray a multitude of roles, from an astronaut to a prostitute. **Story written by: Robert C. Jones, Jr.